A QOZ Partnership Interest is one of three types of assets in which a Qualified Opportunity Fund (“QOF”) can invest. We discussed the other two asset types – Qualified Opportunity Zone Business Property (QOZBP) and Qualified Opportunity Zone Stock – in previous articles. As a limited partner in a typical limited partnership investment, partners receive a share of profits generated by an underlying investment, without having to worry about their personal assets being liable should anything go wrong. In other words, what is at risk is limited to what they have invested. 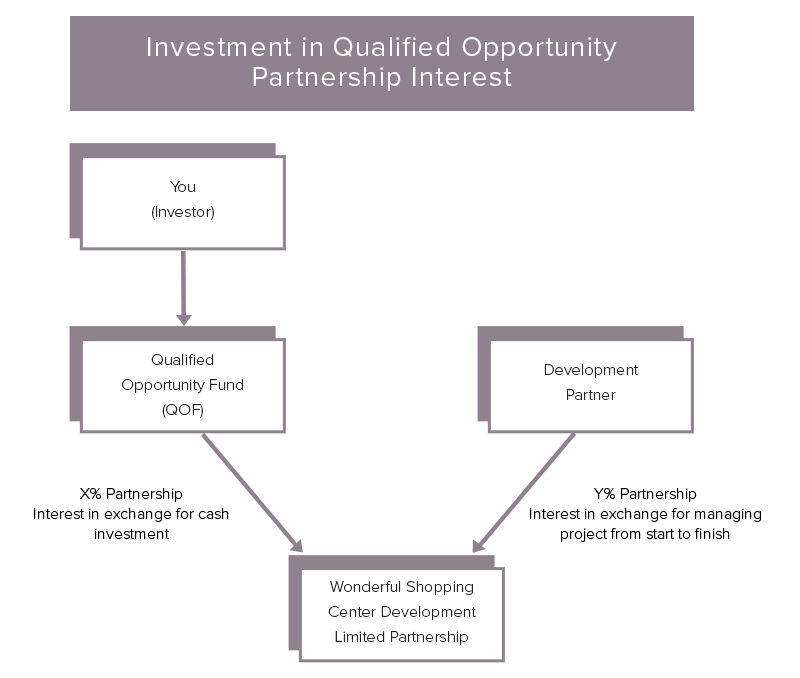 This also holds true for a Qualified Opportunity Zone Partnership, however the partners are not directly investing in a QOZ Partnership Interest, the Qualified Opportunity Fund (QOF) is. An investor cannot take their realized capital gains from the sale of an asset and invest them directly in a Qualified Opportunity Zone (QOZ) to defer taxes. Rather, those gains must be funneled into a certified Qualified Opportunity Fund. The fund can then use that money to invest in a QOZ Partnership Interest. Note that "solely in exchange for cash" is referencing the fact the QOF must acquire the partnership interest with strictly cash using investor funds. The partnership as a whole, however, can use leverage to expand its balance sheet as it so pleases. The QOF is invested in a partnership interest of the QOZ Business. The investors participation is limited to that of investing your deferred capital gains into the QOF, or any outside cash investment should it be brought into the fund as well. The partnership must run as a QOZ Business, subject to requirements outlined by U.S. Department of the Treasury and the Internal Revenue Service (IRS). Specifically, that substantially all of the tangible property owned or leased by the entity is QOZ Business Property and earns at least 50% of its gross income from the active conduct of a trade or business, among other requirements. Assume that an investors Qualified Opportunity Fund (“QOF”) decides to invest in an abandoned shopping center in a QOZ, except the fund does not want to handle the real estate directly. Instead, it enters into a partnership with Development Partner LP. The QOF supplies the capital (Limited Partner), while Development Partner contributes its expertise and leadership in remodeling the shopping center, getting it leased and managing it going forward (General Partner). When it comes time for the partnership to sell, the QOF and Development Partner sell the center and split the proceeds according to the agreed upon terms. The investor receives a percentage of those proceeds, less any costs associated with the Limited Partnership or management fees, as well as deferral on the initial capital gains you invested in the QOF depending on the hold period. Remember, however, that there is no guarantee of return or proceeds, and that there can be a split of losses instead. The QOF makes the decision as to what type of investment it will make in a QOZ. However, understanding the different types of investments can help investors better determine the right QOF for their particular investment strategy. 1. Legal Information Institute. 26 U.S. Code § 1400Z-2 - Special rules for capital gains invested in opportunity zones. Cornell Law School.